3 LOG CAKES FROM CARLTON HOTEL TO BE WON! Offering both sweet and tangy goodness in a delicate creation, the Mango Yuzu Manjari Log cake is a lovely balance of sweet fresh ripped mangoes combined with flavour of yuzu, a refreshing Japanese citrus fruit, melts in your mouth. The bittersweet Valrhona Manjari dark chocolate coating serves as a welcome to those who prefer a less-sweet option. 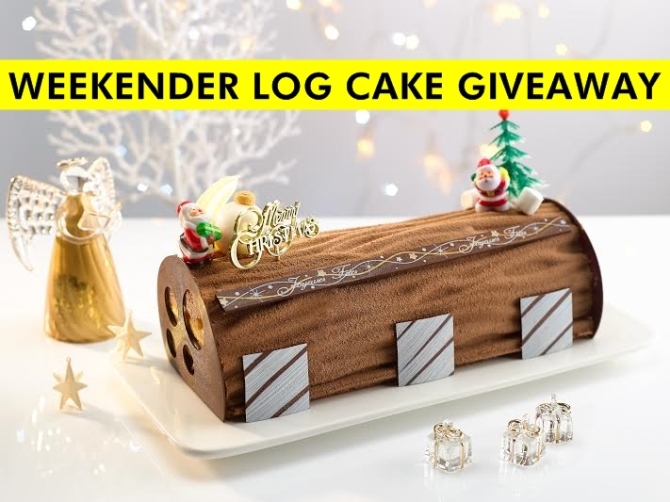 Win a log cake for yourself this Christmas! Previous PostTop 5 events to check out this weekend (5-7 Dec) Next PostElderflower or Red Berries cider for you? Hope to win this log cake for my daughter! Like, Share and win a Christmas L9g Cake. Get a chance to win this cake. Hope i win this pretty cake. Let celebrate the Christmas of joys with Weekender giving away a log cake. Hope to win this log cake for my family. I hope to WIN A LOG CAKE FOR CHRISTMAS in sharing with my fellow colleagues in Dover Parkview’s Management Office! A Log cake this Christmas would be a special treat! What is Christmas without logcake. Love this! I hope to win a log cake for my family’s Christmas party! I wish to win this beautiful logcake to celebrate this special Christmas with my hubby! We just got married in nov and this will be our first xmas celebration as Mr & Mrs! Previously we celebrated as Boyfriend & Girlfriend for 12 years! Hope to win this for my family! I pick up a copy of the Weekender-December 7 – 11 at 7-Eleven Shell gas station, Alexandra after bought some magazines at the store. Thank you Carlton Hotel for the lovely Mango Yuzu Manjari log cake with the bittersweet Vairhona Manjari dark chocolate coating giveaway, It will be a great Christmas gift! via Weekender! Yes, Christmas Time & Great Christmas Gift! I love this Log cake. A perfect mango and chocolate combination. Hope to win it to shared with my love ones. Hope to win this for a fantastic xmas housewarming party! Hope to win this delicious log cake! hohoho, santa clause is around the corner. Hope i can celebrate this Christmas with a delicious log cake with all my families!